"Our universe would be destroyed": Inside the science of "Interstellar"
Excerpted from "The Science of 'Interstellar'"
In Interstellar, the gravitational anomalies excite Professor Brand for two reasons. If he can discover their cause, that may trigger a revolution in our understanding of gravity, a revolution as great as Einstein’s relativistic laws. More important: If he can figure out how to control the anomalies, that could enable NASA to lift large colonies of people off the dying Earth, and launch them toward a new home elsewhere in the universe. For the Professor, the key to understanding and controlling the anomalies is an equation he has written on his blackboard. In the movie, he and Murph struggle to solve his equation. Before filming began, two impressive Caltech physics students filled notebooks with calculations about the Professor’s equation. Elena Murchikova filled a clean, new notebook with calculations by grown-up Murph, calculations written with elegant calligraphy. Keith Matthews filled a beat up, old notebook with calculations by Professor Brand, in the more sloppy handwriting common for old guys like the Professor and me. In the movie, grown-up Murph (played by Jessica Chastain) discusses the math in her notebook with the Professor (played by Michael Caine). Murchikova, an expert in quantum gravity and cosmology, was on set to advise Chastain about her dialog and notebook, and things she was to write on the blackboard. It was startling to see these two brilliant and beautiful women from very different worlds, both with bright red hair, huddled together. As for me, I filled Professor Brand’s blackboard with diagrams and mathematics, including the Professor’s equation— THE equation—at Christopher Nolan’s request, of course. And I took great pleasure in talking with Michael Caine, who seemed to view me as a sort of prototype for the Professor he was playing. And great pleasure in watching Chris, a master craftsman, mold the scenes he was filming into precisely the form he wanted. Some weeks before filming in the Professor’s office, Chris and I went back and forth about what should be the nature of THE equation. Here’s my long scientist’s interpretation for what we wound up with—my extrapolation of the movie’s story. In my extrapolation, it does not take long for the Professor to convince himself that the anomalies are due to gravity from the fifth dimension. From the bulk. Why? The sudden changes in tidal gravity have no apparent source in our four-dimensional universe. 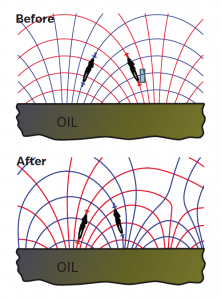 For example, in my extrapolation the Professor’s team sees the tidal gravity above an oil deposit switch, in just a few minutes, from the pattern we expect (top picture, below) to a radically different pattern (bottom picture). The oil has not moved. The rocks have not shifted. Nothing in our four-dimensional universe has changed except the tidal gravity. These sudden changes must have a source. If the source is not in our universe, on our brane, then there is only one other place it can be, the Professor reasons: in the bulk. 1. Some object in the bulk—perhaps even a living object, a bulk being—might come near our brane but not pass through it. The object’s gravity reaches out through all the bulk’s dimensions and so could reach into our brane. However, the AdS layer surrounding our brane would drive the object’s tidal tendex lines parallel to our brane, allowing only a minuscule portion to reach our brane. So the Professor rejects this. 2. A bulk object, passing through our brane, could produce tidal gravity that changes as the bulk object moves. However, in my extrapolation most of the patterns of changing gravity that the Professor’s team observed don’t fit this explanation. The tendex lines tend to be more diffuse than those from a localized object. Some tidal anomalies might be from localized objects, but most must be something else. 3. Bulk fields passing through our brane could produce the changing tidal gravity (left side, below). This, the Professor concludes in my extrapolation, is the most likely explanation for most of the anomalies. What is a “bulk field”? Physicists use the word field to mean something that extends out through space and exerts forces on things it encounters. We have already met several examples of fields that live in our universe, our brane: magnetic fields (collections of magnetic force lines), electric fields (collections of electric force lines), gravitational fields (collections of gravitational force lines); and tidal fields (collections of stretching and squeezing tendex lines). A bulk field is a collection of force lines that resides in the five-dimensional bulk. What kind of force lines, the Professor doesn’t know, but he speculates; see below. 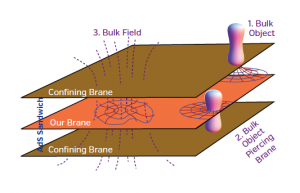 The diagram below shows a bulk field (dashed purple lines) passing through our brane. This bulk field generates tidal gravity in our brane (red and blue tendex lines). As the bulk field changes, its tidal gravity changes, resulting (the Professor thinks) in most of the observed anomalies." But that isn’t the only role of bulk fields, he suspects—in my extrapolation. They may also control the strength of the gravity produced by objects living in our brane, such as a rock or planet. The gravity of each little bit of matter in our brane is governed, to high accuracy, by Newton’s inverse square law (Chapters 2 and 23): its gravitational pull is embodied in the formula g = Gm/r2, where r is distance from that bit of matter, m is the mass of that bit of matter, and G is Newton’s gravitational constant. This G controls the overall strength of the gravitational pull. In Einstein’s more accurate, relativistic version of the gravitational laws, the strength of gravity, and the strength of all the warping of space and time produced by matter, are also proportional to this G.
If there is no bulk—if the only thing that exists is our four-dimensional universe—then Einstein’s relativistic laws say that G is absolutely constant. The same everywhere in space. Never changing in time. But if the bulk does exist, then the relativistic laws allow this G to change. It might, the Professor speculates, be controlled by bulk fields. It probably is controlled by bulk fields, he thinks. That’s the best explanation for one of the observed anomalies in my extrapolation of the movie’s story. The strength of the Earth’s gravitational pull varies slightly from place to place due to the varying density of the rocks, oil, oceans, and atmosphere. Earth-orbiting satellites have mapped this varying strength. As of 2014 the most accurate map is from the European Space Agency’s satellite GOCE1 (top map below). 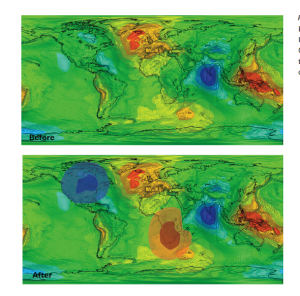 In 2014, the Earth’s gravity is weakest in southern India (blue spot) and strongest in Iceland and Indonesia (red spots). In my extrapolation, this map did not change noticeably until anomalies started appearing. Then one day, quite suddenly, the Earth’s gravitational pull in North America weakened a bit, and in South Africa it strengthened (bottom map). Professor Brand tried to explain this as a change in the tidal forces produced by bulk fields, but had difficulty. The best explanation he could find is that the gravitational constant G increased inside the Earth, below South Africa, and decreased inside the Earth, below North America. Rock below South Africa was suddenly pulling more strongly; rock below North America was suddenly pulling more weakly! These changes must have been produced by some sort of bulk field that passes through our brane and controls G, he reasoned. Bulk fields are not just the key to gravitational anomalies on Earth, Professor Brand believes (in my extrapolation). Bulk fields also play two other crucial roles: They hold the wormhole open, and they protect our universe from destruction.Holding the Wormhole OpenThe wormhole that connects our solar system to Gargantua’s neighborhood, if left to its own devices, will pinch off. Our connection to Gargantua will be severed. This is the unequivocal conclusion of Einstein’s relativistic laws. If there is no bulk, then the only way to hold the wormhole open is to thread it with exotic matter that repels gravitationally. The dark energy that may accelerate our universe’s expansion is probably not repulsive enough. In fact, it seems likely, in 2014, that the laws of quantum physics prevent even an exceedingly advanced civilization from ever collecting enough exotic matter to hold the wormhole open. And I imagine this conclusion is even more certain in Professor Brand’s era.But there is an alternative, the Professor realizes in my extrapolation of the movie’s story. Bulk fields may do the job. They may hold the wormhole open. And since the Professor thinks the wormhole has been constructed and placed near Saturn by bulk beings, bulk fields holding it open seem natural to him." In order for gravity in our universe to obey Newton’s inverse square law to high accuracy, our brane must be sandwiched between two confining branes with AdS warping between them. However, the confining branes are filled with pressure and prone to buckle, like a playing card pinched between two fingers. This is the unequivocal prediction of Einstein’s relativistic laws, applied to the bulk and branes. This buckling, if not counteracted, will make the confining branes collide with our brane—with our universe. Our universe will be destroyed! Obviously, our universe has not been destroyed, the Professor observes in my extrapolation. So something must prevent the confining branes from buckling. The only thing he can think of to do the job is bulk fields. Whenever a confining brane starts to bend, bulk fields must somehow exert a force on it, pushing it back into its proper, straight shape. The Professor’s Equation, at Last! The laws of physics are expressed in the language of mathematics. Before Cooper met Professor Brand (in my extrapolation of the movie’s story), the Professor tried to build a mathematical description of the bulk fields and how they might generate anomalies, control our universe’s gravitational constant G, hold the wormhole open, and protect our brane from collisions. In creating this mathematics, the Professor was guided by the trove of observational data his team was collecting, and by Einstein’s relativistic laws of physics in five dimensions. The Professor embodied all his insights in a single equation, THE equation, which he wrote on one of the sixteen blackboards in his office. Cooper sees the equation on his first visit to NASA, and the equation is still there thirty years later, when Murph has grown up to become a brilliant physicist in her own right, and is helping the Professor try to solve it. This equation is called an “Action.” There is a well-known (to physicists) mathematical procedure to begin with such an Action, and from it deduce all the nonquantum physical laws. The Professor’s equation, in effect, is the mother of all nonquantum laws. But for it to give birth to the right laws—the laws that predict correctly how the anomalies are produced, how the wormhole is held open, how G is controlled, and how our universe is protected—the equation must have precisely the correct mathematical form. The Professor doesn’t know the correct form. He is guessing. His is an educated guess, but a guess nevertheless. His equation contains lots of guessing: guesses for the things called “U(Q), Hij(Q2), Wij, and M(standard model fields)” on his blackboard. In effect, these are guesses for the nature of the bulk fields’ force lines, and how they influence our brane, and how fields in our brane influence them. When the Professor and his team speak of “solving his equation,” in my extrapolation they mean two things. First, figure out the right forms for all these things they are guessing: “U(Q), Hij(Q2), Wij, and M(standard model fields).” Second (following the well-known procedure), deduce, from his equation, everything he wants to know about our universe, about the anomalies, and most important, about how to control the anomalies so as to lift colonies off the Earth. When characters in the movie speak of “solving gravity,” they mean the same thing. In the movie, when the Professor is very old, we see him and grown-up Murph trying to solve his equation by iterations. On a blackboard, they make a list of guesses for the unknown things (guesses that I wrote on the board just before the scene was filmed). Then, in my extrapolation, Murph inserts each guess into a huge computer program that they’ve written. The program computes the physical laws for that guess, and those laws’ predictions for how the gravitational anomalies behave. In my extrapolation, none of the guesses predicts anomalies that look anything like the observations. But in the movie, the Professor and Murph keep trying. They keep iterating: making a guess, computing the consequences, abandoning the guess, and going on to the next guess, one guess after another after another after another, until exhaustion sets in. Then they begin again the next day. A bit later in the movie, when the Professor is on his deathbed, he confesses to Murph: “I lied, Murph. I lied to you.” It is a poignant scene. Murph infers that he knew something was wrong with his equation, knew from the outset. And Dr. Mann tells the Professor’s daughter as much in an equally poignant scene on Mann’s planet. But, in fact—Murph realizes, soon after the Professor’s death—“His solution was correct. He’d had it for years. It’s half the answer.” The other half can be found inside a black hole. In a black hole’s singularity. Excerpted from "The Science of 'Interstellar'" by Kip Thorne. Published by W.W. Norton and Co. Inc. Copyright 2014 by Kip Thorne. Reprinted with permission of the publisher. All rights reserved.